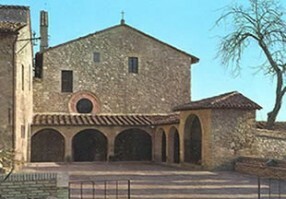 The church of San Damiano does not have a great importance under the artistic point of view, especially if you compare it with some of the basilicas of Assisi, however it is a place to which are indissolubly linked the stories of San Francesco and Santa Chiara. In this countryside oratory, just outside the walls of the village, during the summer of 1205 after Christ St. Francis feels the Crucifix, that nowadays is kept in the chapel of the same name of the Basilica of St. Clare, exhort him to restore the church; in the cave under the edifice, the Saint hided himself from his father who was obstructing his monastic choice. Here St. Clare spent her monastic experience from 1212 after Christ and founded the Order St. Clare; in the "small hut of linens in a corner of the house" San Francesco wrote the first draft of the Canticle of the Creatures, and in the dormitory of San Damiano, Santa Chiara died on August 11th of 1253 after Christ, just two days after the visit of Pope Innocent IV.What mostly moves of the place is the silence, and the sense of secondment that whoever feels going from the village to this church; San Damiano is only, after all, a little bit more than one kilometre away from the Basilica of San Francesco, but, maybe for the olive fields around it, or maybe because it is visited more from pilgrims praying than from simple tourists, the distance seems to be a lot longer. The façade of the church is characterized by a portico that allows the access on the right side to the chapel of San Girolamo where are present some frescoes of Tiberio of Assisi dating back from 1517 and 1522 after Christ. The internal part, at one nave and apse decorated of frescoes from the 14th century, has a wooden choirs of the first years of the 16th century and a copy of the original Crucifix. Inside the convent are present a Crucifixion of Pier Antonio Mezzastris from 1482 after Christ, in the refectory some frescoes of Dono Doni and, in the cloister, the works of Eusebio da San Giorgio from 1507 after Christ representing "San Francesco receiving the stigmata" and "the annunciation".